you should make a how to video with what you do step by step! You should offer case painting as a service. 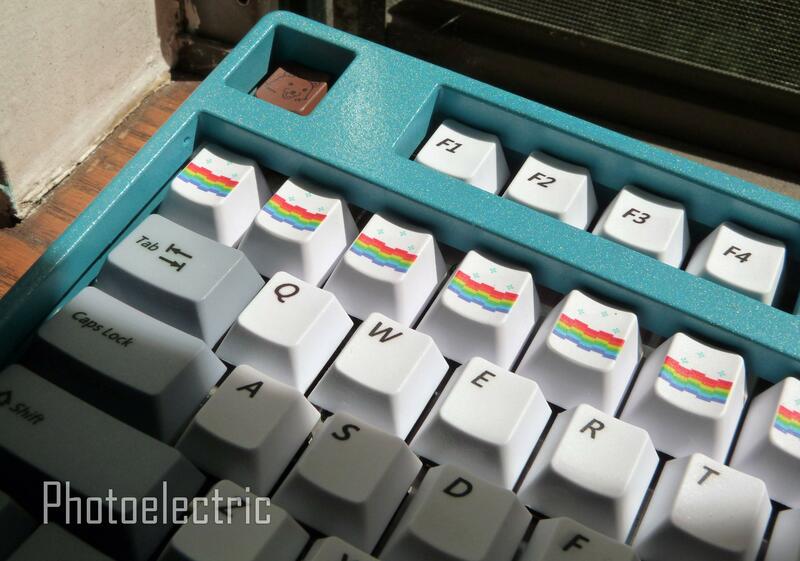 I am, sort of... already painted 2 people's keyboards, and 2 more coming soonish. But I can't make it into a mass-production type deal. It's a hobby, and I have to do it outside (paint fumes are not exactly healthy). Sometimes it rains, sometimes it's too hot. I also want to make sure people are happy with the results, which means I take time to paint, polish, etc. How much $ would you say is needed to get the stuff to paint a case? Like I know a can of paint is at least ~$5 and then there's the sand paper (and it seems like I need multiple different grits), but im not sure about all the other things like the polishing/rubbing compounds,primer, and clearcoat. Seems like this all adds up to a decent amount, which means I may just try and go for an acrylic case since I don't plan on painting that much. Well if you don't want to get fancy, just paint is all you need. If you want to get fancy stuff, different sandpaper is around $5 a package from automotive stores (that's per each roughness level). Rubbing compound and polish are around $10 per bottle. I use them with large cotton balls for small surfaces like keyboard covers (can get those at a pharmacy). Paint can be cheap and less cheap. Rust-Oleum Painter's Touch / UltraCover and Stops Rust lines are around $4-6 at Home Depot. Universal line is more like $8. Fancier metal flake paints are more like $10-13 a can. 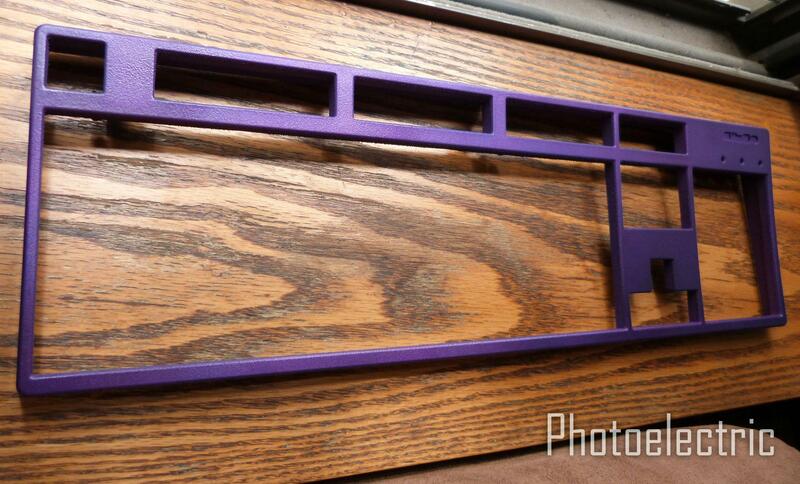 If you just do paint and don't plan to polish, go with flat or satin finishes--not gloss. Same for clear coat: satin or flat. It's still cheaper to paint than to buy an acrylic case, even with all the added costs. Plus I'm not sure about those acrylic cases--I feel like they scratch easily, especially the gloss finishes. Fine swirls and such from cleaning over time. I'd love for someone to comment on that though. That's some really useful content here. I didn't know you could expect such good results with paint in can and car detailing techniques. Thanks for the information, I really appreciate it. I didn't even consider how easily those acrylic cases can be scratched. 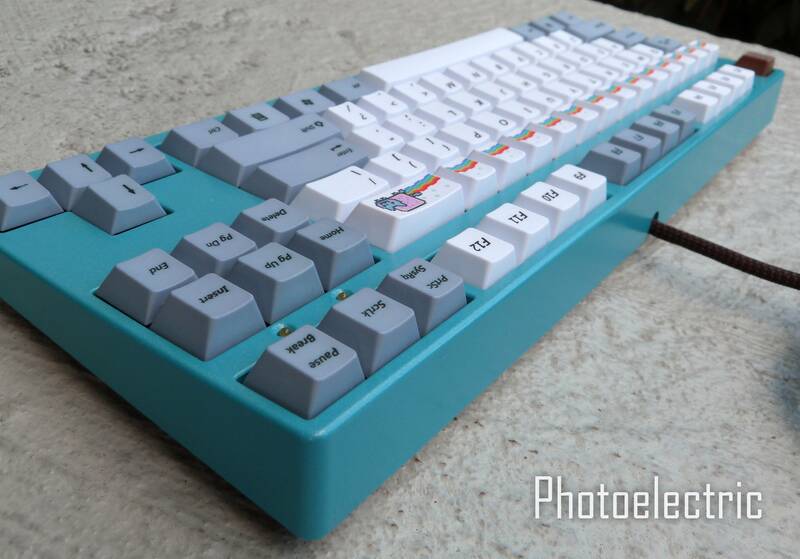 I really want an aluminum case since those reds look so nice, but they're also really expensive and I don't think I've seen any for QFR. I'll have to look into paints to see if there is something I like. 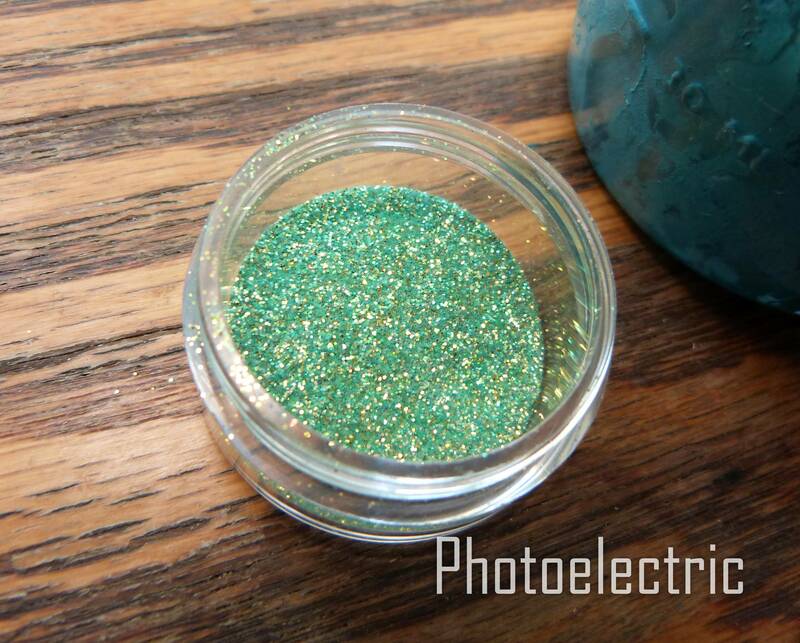 Not sure if I like how metal flake looks kind of...sparkly? but I think it would look much better than just plain gloss red. 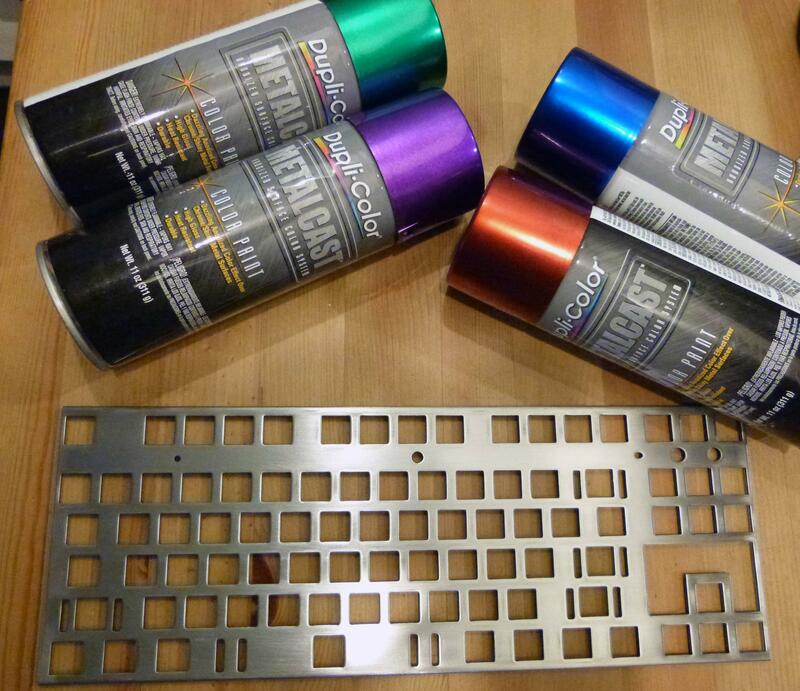 If you're going to paint aluminum, you should do some reading about it. I believe you need a base coat of some sort: a primer for bare metal. 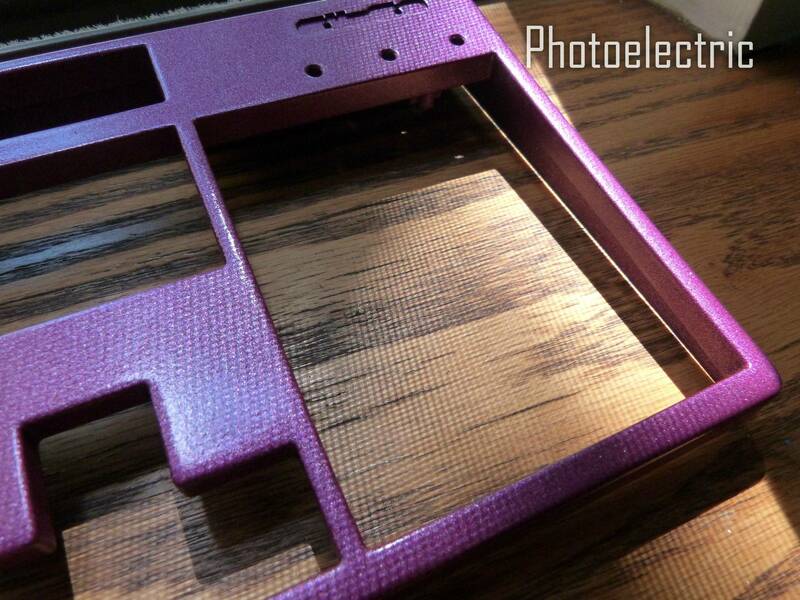 I know there are also semi-transparent paints that work to look like anodizing that can go over bare metal. For example, DupliColor MetalCast. 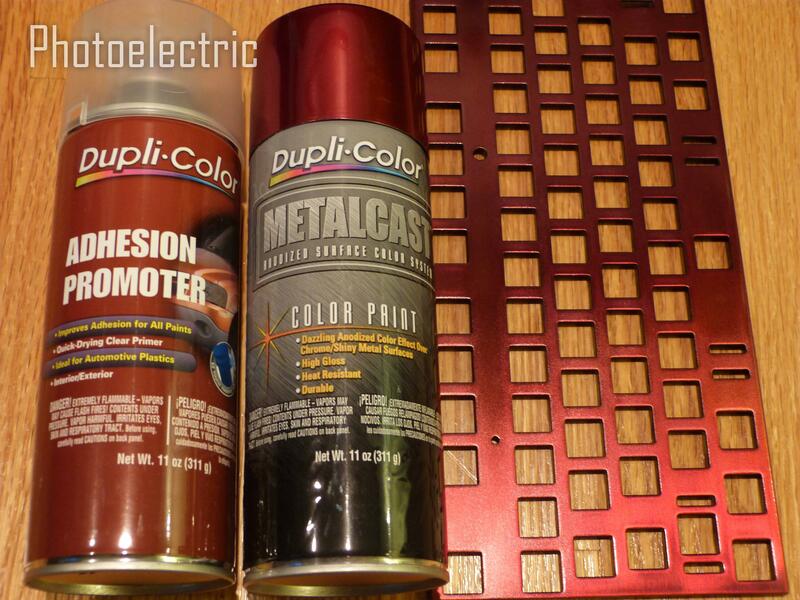 MetalCast paints are semi-transparent (I have 4 of them), and you keep misting them on to get desired color intensity. 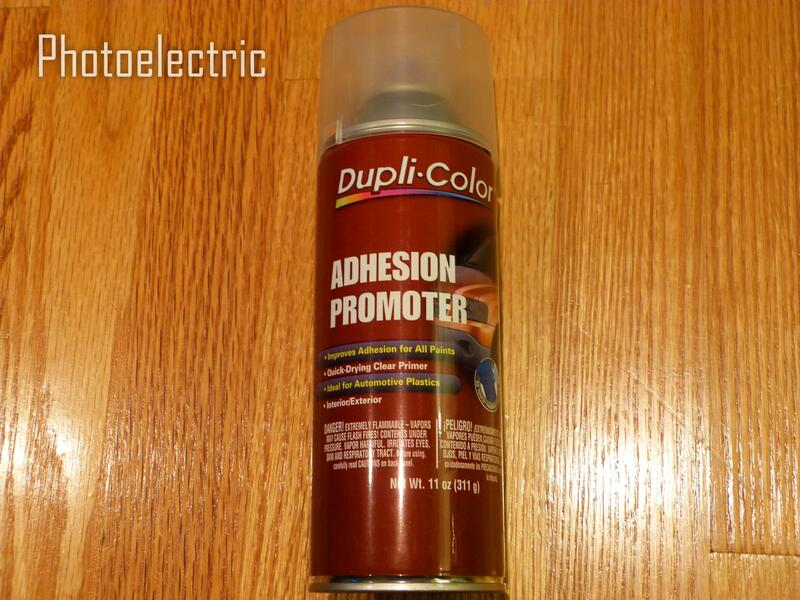 From what I've read on auto forums when reading about paint, they can be very durable. They may need a top clear coat. If you want to do non-transparent enamel, you will still need a primer. 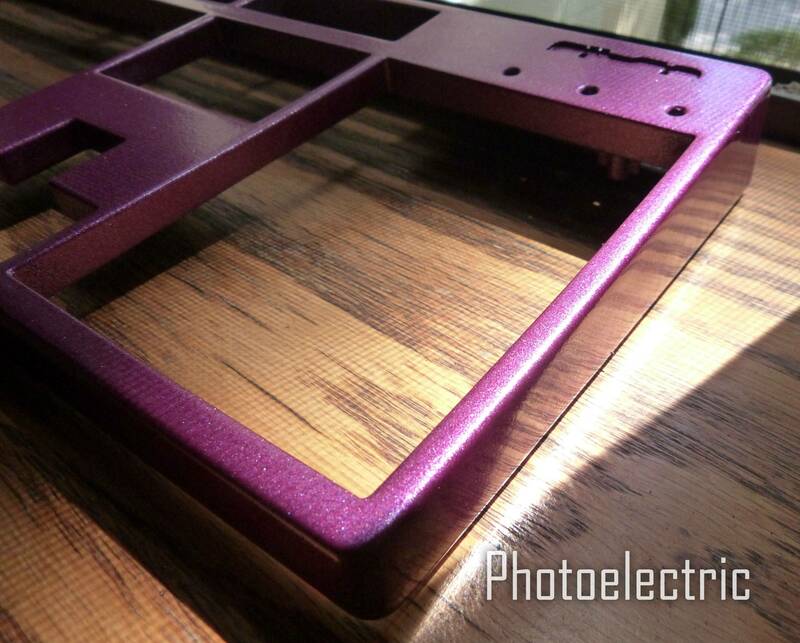 And I'm not sure if it's okay to spray over the anodized coat or if you need to sand it off to bare metal first. I don't know how easily they scratch--it's something I'd like to know about myself. It's my guess that they scratch easily, at least in terms of fine scratches you can see against the light. Just based on acrylic I've used. But maybe there are different grades of acrylic, and the ones used for those cases are really nice and scratch-proof. Oh I don't plan on painting aluminum, I just meant I really like the way they look. If I paint anything it will just be a QFR top cover. edit: also thinking about it...I really hated the gloss black on my das, I don't think I'd want a case like that again. I guess that means acrylic is out. Yeah, I was replying to Batmann as you posted your reply at the same time Fixed to include quotes and reply to you as well. Just finished exam week and finally got to painting my case, choose white gloss. Thank you so much for the detailed guide. Cool geometric design! The case paint came out very nicely. How many layers do you put on your plate? The paint makes the plate look kind of bulgy. The paint layer is extremely thin. What you think of is bulgy is optical illusion, because the paint is semi-transparent, so you see the steel underneath. 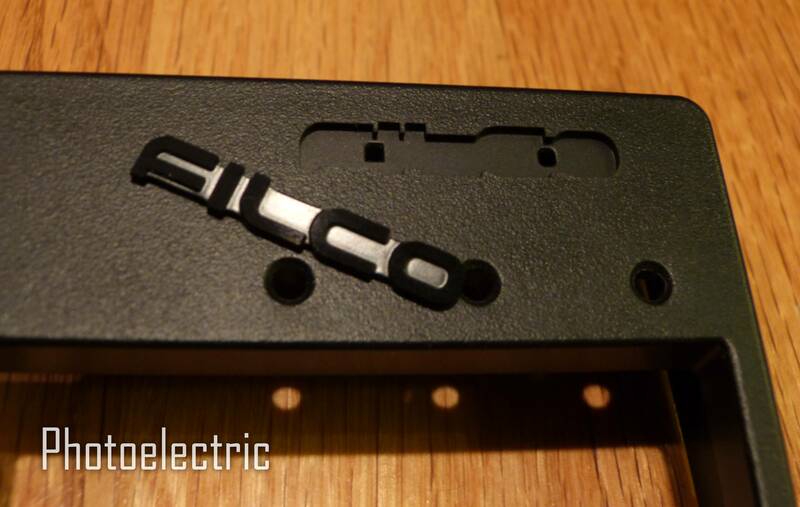 In some cases it came out brushed-like from sanding, and in other areas (particularly the thin parts between the switch holes), the steel surface is sanded in more random directions a bit, as the black powder coating was difficult to get off those areas neatly. 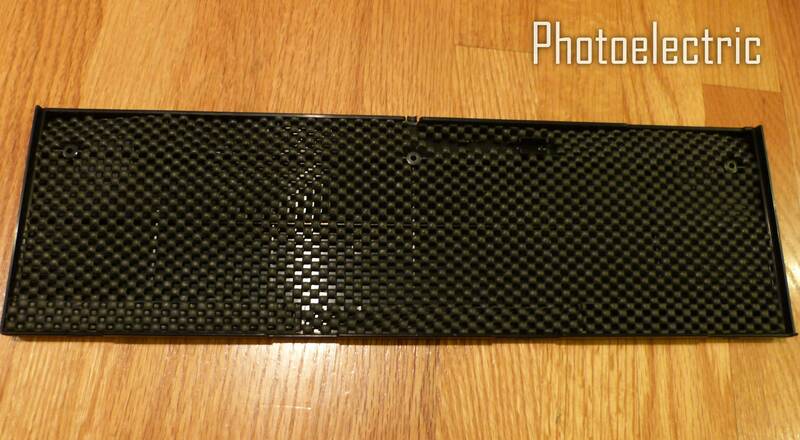 It also felt like the surface was not perfectly smooth before it was powder coated--almost slightly porous. I tried to make it look "brushed", but it was not an easy feat to do that neatly. Anyway, the new paint coat is thinner than the old powder coat, and it's slick to touch. Anyway, this would work better with more thorough sanding along the same direction, or on clean metal that's not been painted / sanded before. I don't have any fancy sanding tools though. Thanks for the explanation. Would it be easier/better to sand it with a Dremel? I think it would depend on what Dremel you're using. 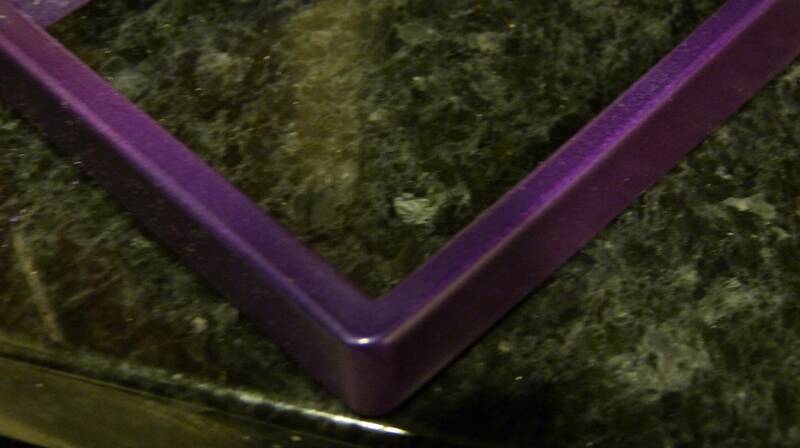 The one I have takes pretty small sanding discs, you'd be all day going over the surface of a keyboard plate. If you have one of those oscillating sanders (I think Dremel makes one...) with a sanding surface about the size of a business card, that might work well to sand the flat areas. FWIW, I sanded the steel plates I got from Beast's buy, by hand. The sharp edges destroyed the sandpaper quickly, but I used a small block of wood to get a flat surface, and the end result looks pretty nice. I'm torn between leaving them as glossy stainless steel, or painting them, all these pictures make me want to experiment with some custom colors. Perhaps. 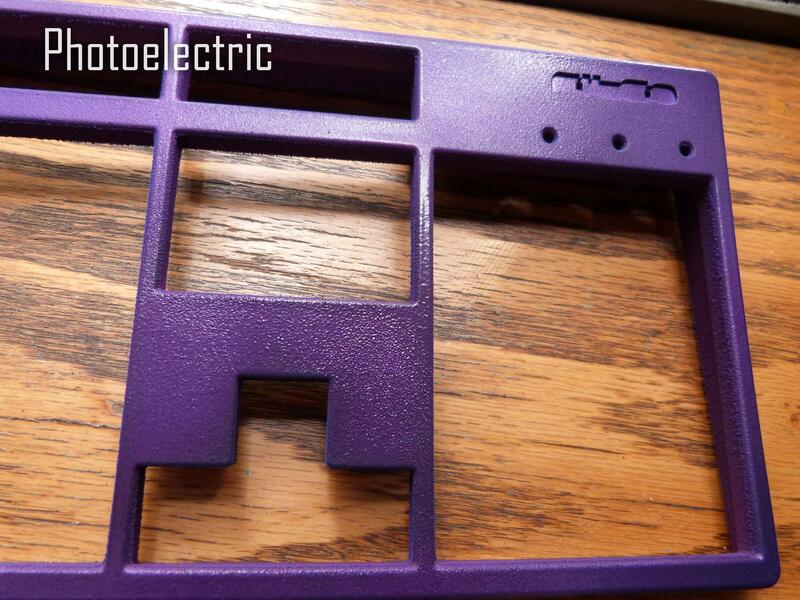 But when I tried to sand the whole plate horizontally with a sanding block, I was not getting enough of the powder coat off those thin areas between the switches. It came off easily from the edge areas, but in the "middles" I had to go with small pieces of 200-grit sandpaper and sand longitudinally along the direction of those "bars". It was a messy job, as it was ruining my brushed appearance, so I was trying to not sand too much, and after all was finished, I brushed everything from left-to-right again. Nonetheless, despite a lot of sanding, I feel that some areas of the original surface still contain fine amounts of powdercoating, as the original surface was not 100% smooth, and perhaps sandblasted-like, so some powder coating was wedged in quite firmly between small particles of steel. You can see those areas are darker (in part due to fine remnants of powder coating that was not visible to naked eye in most lighting, and in part because of the "grain" of the surface being more sandblasted-like). I decided to give some craft paints a try: like Tamiya and Testors. They come in many fun colors, and I found a place that sold them for <$5 a can. The Tamiya I got is an acrylic lacquer in a pink pearl color (TS-59). It goes on reasonably smoothly. The Testors paints I got are oil enamels, and I would not recommend them at all. The spray pressure is high and they go on too runny. Not easy to control for thin coats if you want to layer thinly to avoid dark results. 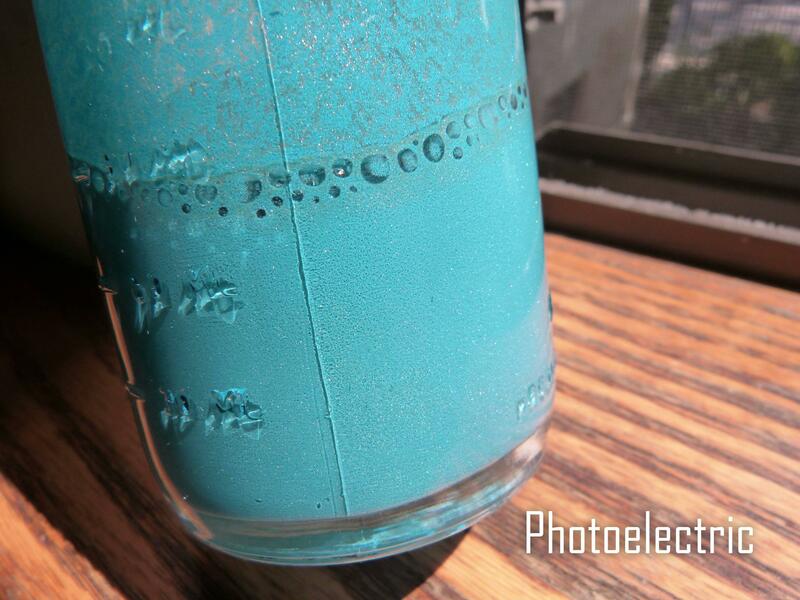 "Turquoise Metallic" Testors was so bad that it bubbled and ran like crazy. Completely uneven finish. 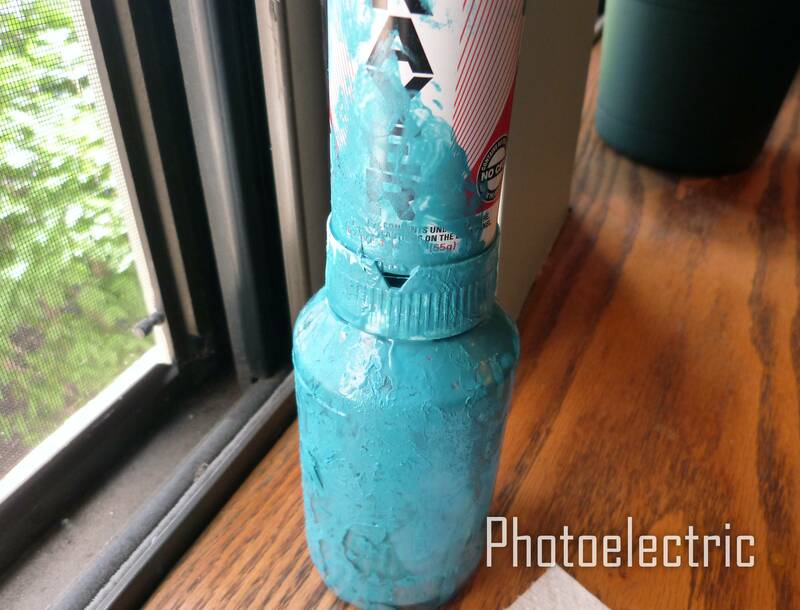 I don't know what happened to that can, other than it was normal temperature, and the other two cans (Testors "Bright Aqua Pearl" and Tamiya "Light Red Pearl") went on fairly smoothly. "Bright Aqua Pearl" was definitely not very bright but a rather dark greenish blue after a couple of coats (at the pressure the paint comes out of the can). Personal recommendation: avoid Testors paints. I've read that Tamiya sprays more smoothly, and that seems to be the case in my sample painting yesterday. And of course you get tiny amounts (only 3oz) per can. 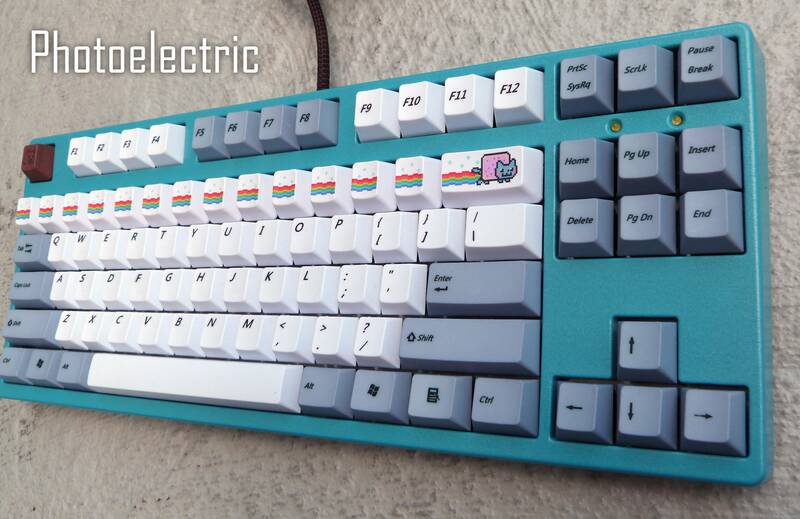 So maybe 1 TKL cover. 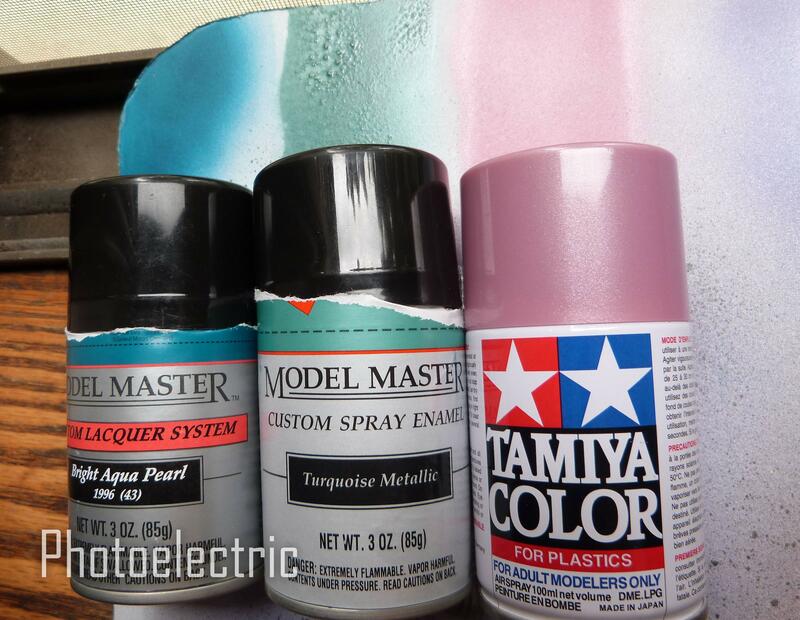 Also note that Tamiya paint is acrylic, so you can't spray it over oil enamel. But you can coat it with a clear oil enamel top coat. I just wanted to say thanks so much for all your tips and advice! It was a lot of work, and I definitely know some aspects I'd do differently, but it was also very satisfying to mod a keyboard case to exactly the color/design I wanted. 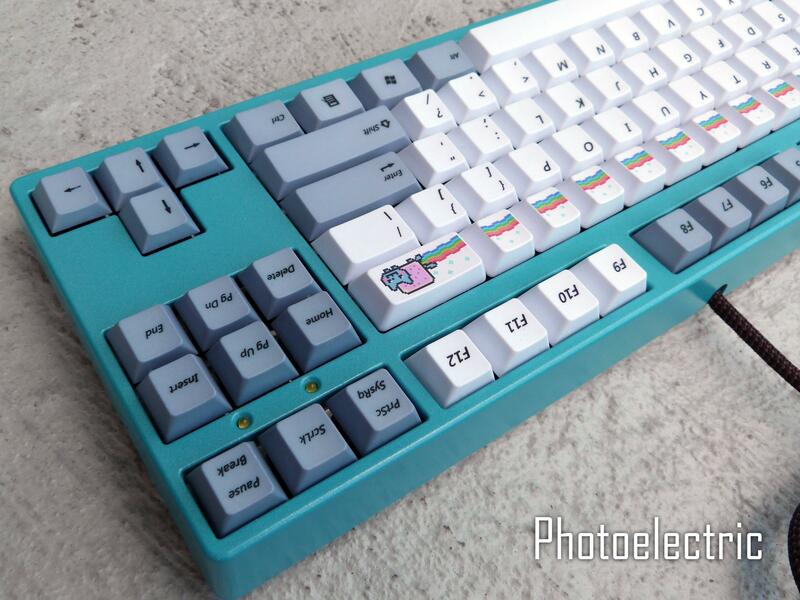 Just noticed you have non-standard caps too (Deck keyboard?) Will look cool with the military set! Yep, I got a Deck 105-key set from Berserkfan, figured I'd try them out on the CM "V" version. I gotta say, I love typing on them, even with the all-one-profile layout. 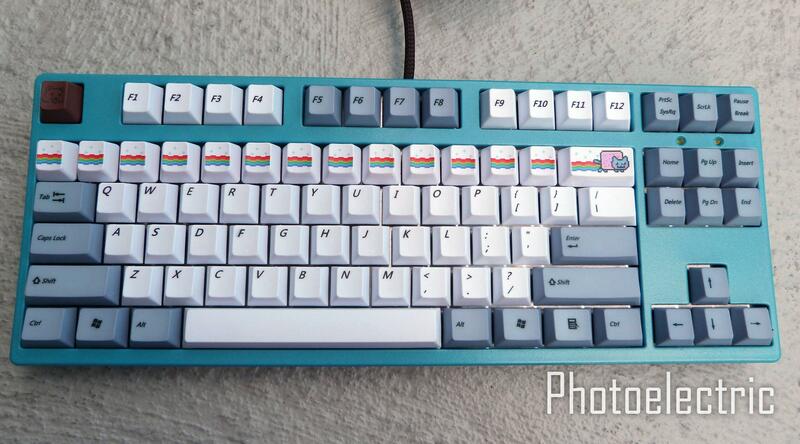 Don't have the right modifer/space bar or macro caps, those are still the CM caps. 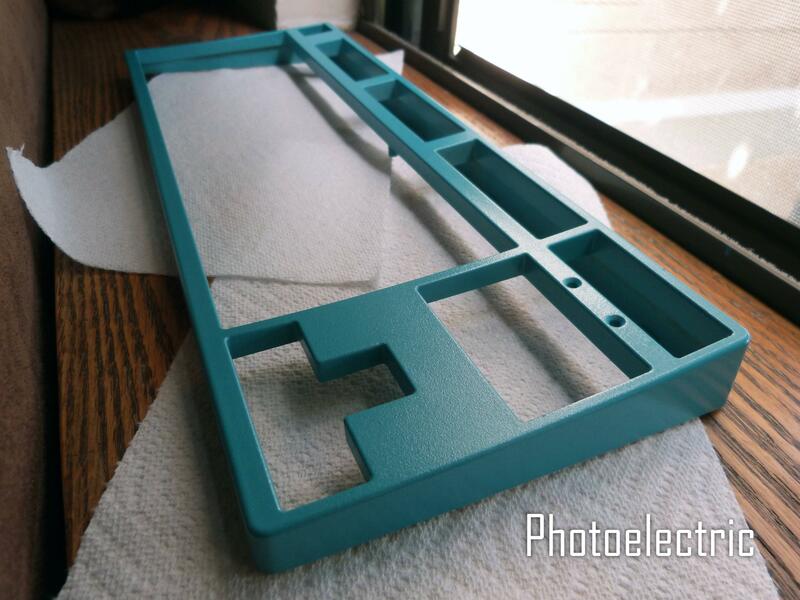 Who here agrees that we should all pitch in to buy Photoelectric a nice airbruch kit? Could you imagine the work photoelectric could do for us? I'm in. Huge appreciation expressed for all of Photoelectric's tips and methods, in this thread and others. Is an airbrush kit the most useful? Perhaps a small-ish HVLP gun? Either way I'd most happily chip in for some equipment! BUT it did spray very smoothly when the paint actually came out. So I finished the cover with some effort. I'll probably use another aerosol sprayer in the future for this, although... this is very messy business, and I can't say that I like it. But it's the only way for me to mix a custom color at the moment. Now on to the cover--I'm very happy with how it came out!! It's drying at the moment, and I am considering adding an iridescent clear gloss over it. The result is very much like slightly aqua sky blue with a gold and white pearl sheen, depending on angle. Almost looks like anodized sky blue aluminum from some angles. I'll have to take better photos outside when it's all finished. * Clear coat: undecided! Probably DupliColor Effex. Mini update: tried on the cover loosely. The clear coat I'll use in a day or two is above. Also added gold + green flakes to the mix and will do another coat after sanding. Then follow with clear. You make this look so good and so easy! Just tell people your a really big smurfs fan. Finished. Didn't come out as smoothly as I had hoped, but I've definitely learned a lot about not adding larger flakes to a paint mix in the future! After iridescent clear coat and a LOT of polishing, it did finally get very smooth and shiny. I have received 6 QFR cases that have been previously painted with something nasty. My guess is Krylon Fusion, which if true, confirms my strong dislike of that whole line. Under the clear coat, the paint is soft and I can scrape it off with my nail. It's kind of rubbery and is a nightmare to sand off, even with my normally very strong standby 3M 200-grit sandpaper. Enter Easy-Off Oven Cleaner (Original). It's not as harsh as some other paint strippers, as I'm trying to not damage the plastic of the covers. Here's a comparison photo of 3 covers: the top cover is the originally painted one, the middle has been sanded for a good while with 200-grit sandpaper, and the third has been sprayed with Easy-Off twice and left to soak and then scrubbed with sandpaper. Significantly less work with Easy-Off though still not as nice to remove as oil enamel. And the worst is that I don't know if I can safely spray over any remnants of that paint, but I'll do a test soon. From the sound of it, I would guess that they were primed with something that didn't play nice with the color coat. I have had a similar reaction when going between model and automotive paints. 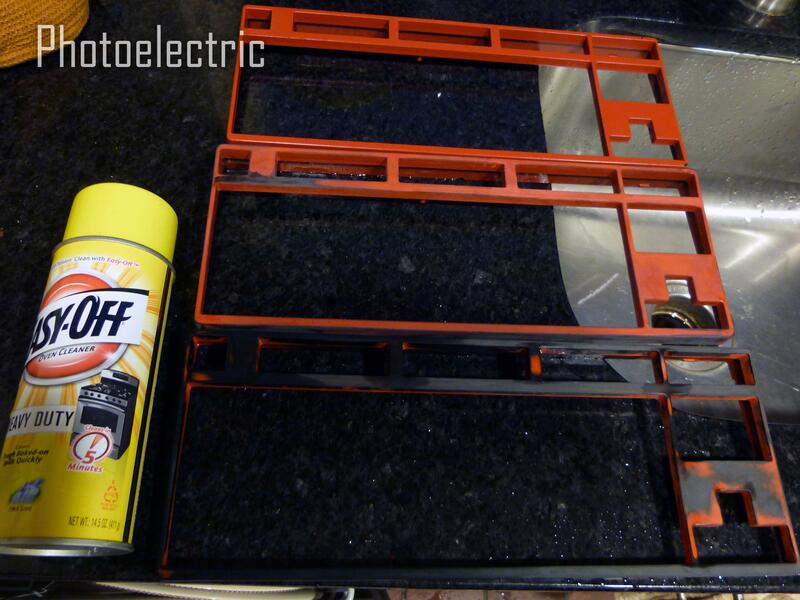 You are doing it right with the oven cleaner. Unfortunately, the only good way to remove gummy paint is with good old elbow grease and heavy grit sandpaper. Yeah that could be. It could be 2 things based on where I got these from--I don't have the answer. 1. acrylic paint (Montana Gold) or 2. Krylon Fusion. I'm betting it's Krylon Fusion, because I've had a similar reaction in the past when I stupidly painted some plastic computer parts with it. I didn't use a primer, and the paint went over bare ABS plastic. The paint didn't quite dry fully, because when I put oil enamel over it a few weeks later and tried to sand it off a couple days later (you can put oil enamel over oil enamel and over acrylic) I found the same goopy sticky mess. It's a big reason why I hate Krylon Fusion. Another reason is that all the Krylon paints I've tried have been really uneven, streaky, smelled bad, and the results were subpar. But anyway, without Easy-Off, the middle cover is what you get after a LOT of elbow grease and high quality 200-grit 3M sandpaper. The bottom one is black thanks to Easy-Off. Learned that the paint is indeed Krylon! 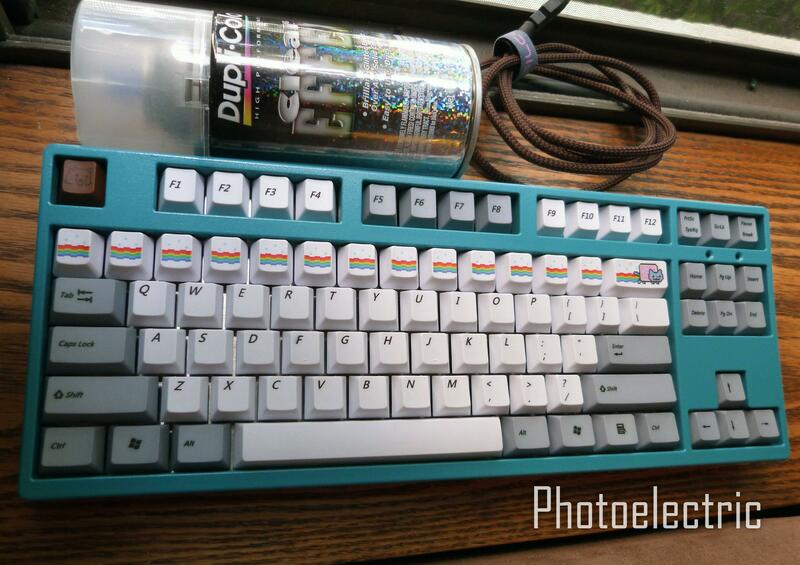 And nowadays I put drawer liner into all keyboards I open Filco ping? What ping? I thought some of you might find this interesting, so I'm posting some "before" photos Namely of DupliColor MetalCast system (base coat + top coats). Pretty, isn't it? I don't think you can even tell that there's metallic silver underneath. Throw some gold flake in there and you might have JDPurple! No gold flake was requested But I can see the resemblance now. It will be more transparent after drying and polishing though. photo are you sure you don't want to become the resident geekhack painter?? I can do a case with a good interval in between, but I'm currently doing a LOT, which I just can't handle regularly. It's not just the painting, but the prep that is time consuming. I like plastic cases that have no coating on them--they are easy: sand to smooth, clean, paint. Covers like the QFR ones have coating on them that takes time to remove. Also I prefer to paint outside so I don't breathe in the paint fumes too much, so basically until it gets into high 50s outside. If I had a garage, things would be easier. And finally I'm always paranoid about doing stuff for others because I can't guarantee perfect results (and I have a certain OCD about things being as perfect as possible). There are factors like dust and quality of rattle cans which are very frustrating to me. I have to improvise a lot. If I had a fancy spray gun and a clean workspace, I'd be more willing to do custom requests. For now, it's an occasional deal. Somebody get that man a workshop and some good equipment, stat! We just need someone to make Photoelectric a collapsible, wind proof workshop and then the rest of us could pitch in to get her a spray gun. Does anybody close to photoelectric have wood working tools and some white sheets? That purple sure looks tasty. 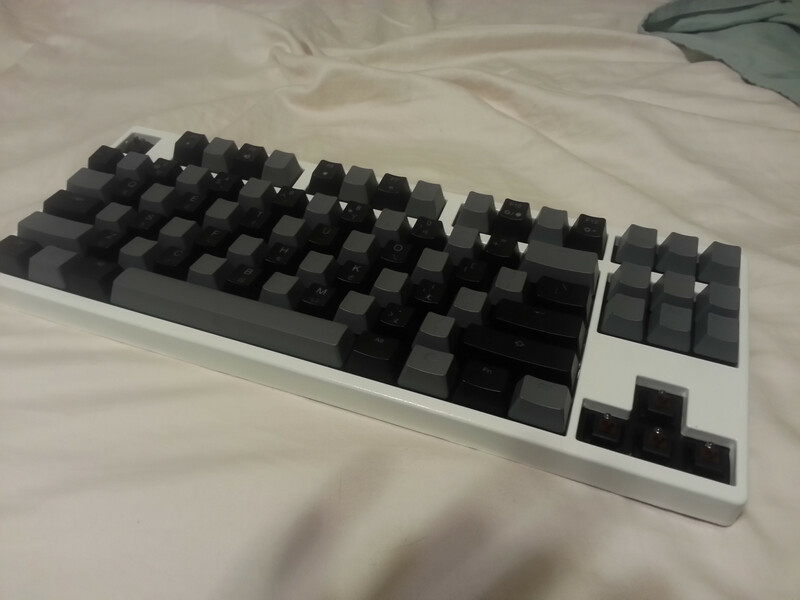 Definitely going to have to type on this board for a day or two before giving it to my friend. Lol.